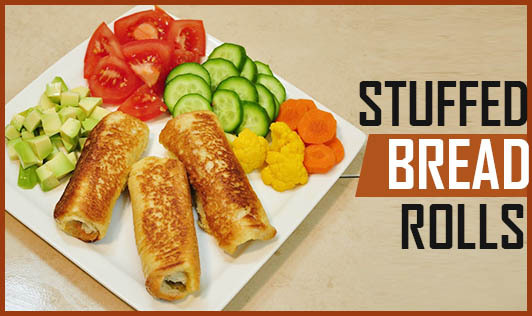 These bread rolls are bread slices stuffed with high-protein hummus, topped with assorted vegetables, rolled up, and grilled to perfection. • In a pressure cooker add ½ cup chickpeas, 3 cups water, salt, and cook for 5 to 6 whistles. Cool, strain, and keep aside. • Grind the chickpeas, along with curd, garlic, green chilies, salt, and vinegar in a blender. Make sure the paste is thick. • Heat oil in a pan and add carrots, cabbage, and salt. • Sauté for 2 to 3 minutes and keep aside. • Slice off the crusts of the bread slices and flatten each slice using a rolling pin. • Now using a butter knife, apply 2 tbsp of the chickpea paste on the flattened side of the bread. • Top it up with 2 tbsp of the vegetable mixture. • Roll up each slice tightly and apply a little butter on the exposed edge of the bread. • Toast the bread in a non-stick pan, rolling them occasionally until they turn golden brown. • To serve, cut each roll into 3 pieces using a pizza cutter. • Serve either with tomato ketchup or green chutney.